How do you keep your Pets Safe during a Disaster? Ask the Expert. . . How do I keep my Pets Safe during a Disaster? Family always comes first, right? Make sure in the event of a disaster all members of your family are accounted for, that means your furry family members too! Keeping your Pets Safe in an emergency situation makes all the difference for your human and furry family! 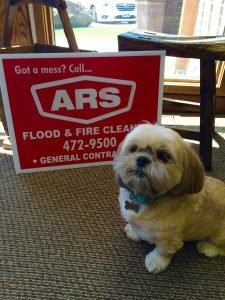 It’s no secret, at ARS, we love our furry critters. 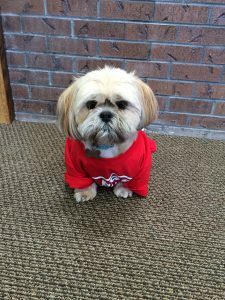 One of our ARS locations even has an office dog. She is affectionately known as “the Disaster Dog.” She guards the office from all delivery men, bunnies, and other scary things. In honor of the Disaster Dog, we are bringing you a few tips on how to keep your Pets Safe during a disaster. Make sure your pet has an ID tag they wear and are chipped if possible. Most pets tend to run in the event of a traumatic situation. This will aid in finding your pet if they get lost and for keeping Pets Safe in general. Keep a pet carrier, a small amount of pet food, maybe a small toy or blanket, a bottle of water, and a leash accessible in the event you need to evacuate your home. Also, if your pet has any medications—be sure to grab those too. If you don’t have your Veterinarian programmed in your phone, keep it handy with Emergency numbers in case your pet sustains any injuries. In your emergency pack, create a tag or sticker for your home letting Emergency Crews know your home has been evacuated and all Pets are accounted for. Pet Safety also means knowing where your pet can stay if you are evacuated from your home. Relief Shelters are unable to take pets that are not service animals. Call and ask local hotels if they are pet friendly or make arrangements with friends or family in the event of an emergency. Have a friend or neighbor be “on-call” per say if your home or neighborhood needs to be evacuated and you are not able to pick up your pet yourself. Make sure they know where your pet is located and have access to your home. If you have livestock, create an emergency plan especially for them in the event of flooding, fire, or other disasters.